Deputies said the man would engage in a normal conversation with the women before grabbing them and forcing them into his vehicle. HARRIS COUNTY, Texas - A man has been arrested after he attempted to kidnap four women and sexually assaulted two of them, according to the Harris County Sheriff's Office. Howard Dickson, 22, was arrested on Tuesday and has been charged with Sexual Assault, Aggravated Sexual Assault, Attempted Kidnapping, and Aggravated Kidnapping. According to deputies, Dickson tried to kidnap two women in Harris County and two more in Montgomery County over the weekend. On Saturday, April 28, around 10:30 a.m., deputies said Dickson tried to abduct a woman in north Harris County when employees with a yard crew helped to rescue her. Dickson fled the scene and just ten minutes later tried to kidnap another woman who was riding a bicycle in a nearby neighborhood. Deputies said Dickson dragged the woman into his vehicle and immediately hit her in the face. She was able to get away when she jumped out of the vehicle. She injured her legs in the ordeal but is expected to be OK.
Howard Dickson was arrested on Tuesday, May 1, 2018 in Montgomery County. Deputies received surveillance footage from neighbors nearby showing the woman jumping out of the car which helped law enforcement track down the vehicle. Employees at a gas station also provided video to law enforcement of the suspect putting gas in his car. The third victim was in Montgomery County and was approached by Dickson on Sunday, April 29 around 3 p.m. Deputies said Dickson attempted to kidnap the victim and forced her to perform sexual acts on him. She was able to get away. About 2 and a half hours later, Dickson coerced the fourth victim into his vehicle. Deputies said he strangled the woman and sexually assaulted her before she too was able to get away. In the days following, one of the victims saw the vehicle and called deputies. Tuesday morning, around 80 officers fanned out and located the vehicle in Montgomery County. Dickson was arrested and is currently in the Montgomery County Jail. Deputies said they feared the suspect was going to continue with the violent nature of the crimes and feared things would only escalate. "That was the progression of his aggression, and that's why it was so important for us to pull out all resources and good old fashion police work is what helped us bring this case to be resolved today." said Lt. Jeff Stauber with the Harris County Violent Crimes Unit. According to deputies, Dickson would approach women nicely, engage in a normal conversation to get them to be comfortable with him and then he would grab them and forced them into his vehicle. In a press conference Wednesday afternoon, deputies said with the community's help and additional law enforcement, they were able to track Dickson down and arrest him. 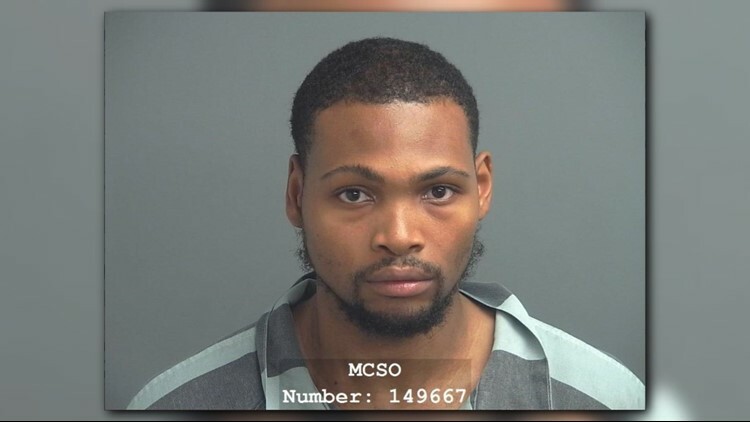 Deputies said there may be more victims out there and urged anyone with information to contact the Montgomery County Sheriff's Office or the Harris County Sheriff's Office.